From The Weekly Standard. January 30, 2012. Yale University Press, 448 pp., $40. It’s safe to say that not many fives would have been given out. We are now, or were at the time he wrote, 17 years away from the general availability of the Internet and are equally clueless about what its long-range effects will be. 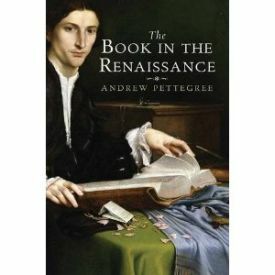 That makes it a good time for Andrew Pettegree’s immensely learned book (new Kindle electronic version now available) The Book in the Renaissance to remind us of where books came from before they disappear from their usual haunts,and libraries, when they continue to exist at all, become even more museum-like than they already are. Among other things, Professor Pettegree, the Head of the School of History and of the Reformation Studies Institute at the University of St. Andrews in Scotland, reminds us that the invention of printing was not the first technological innovation with profound effects for intellectual life. The transition from scroll to codex in the early Middle Ages was as important in its way as that from manuscript to print in the late Middle Ages. Likewise, the use of parchment (that is, animal skins) rather than papyrus was essential to the preservation of learning. In 1522, Duke George, ruler of Ducal Saxony, decided definitely against the Reformation, and prohibited the production or sale of Lutheran texts in his territories. For the publishers of Leipzig this was a dreadful blow. In 1524 a deputation petitioned the Duke, asking to be allowed to publish Luther’s writings once again. The books they were now required to print, written by Luther’s Catholic opponents, were simply unsaleable, they claimed. Figures for the production of books in Leipzig support their complaints. Between 1515 and 1522 over 1,100 editions were published in Leipzig, an average of 140 titles a year. Following the ban on publishing Lutheran works this fell precipitously, to 43 titles in 1523 and 25 in 1524. To add insult to injury these were the years when printing in Germany reached its zenith, a previously unimaginable output of almost 1500 editions per year. There was no doubt that Leipzig’s printers breathed a sigh of relief when, following the conversion of the Duchy to Lutheranism after the death of Duke George they were able to resume publishing Protestant works. This suggests something else about the Reformation itself, which must have been driven forward as much by its identification with modernity and (therefore) fashion as it was by the popular passion for its more democratic and anti-authoritarian elements, or for "the priesthood of all believers." Then, as now, "extremism" sold, which might be something to bear in mind when next you hear the moderate complaints about the polarization of political discourse on the Internet. Luther and Calvin were, of course, best-sellers in their day. On the other hand, Professor Pettegree notes a couple of hundred pages later that Emond Auger managed to stem the Protestant tide in Lyon in 1561 and effect the expulsion from that city of its Calvinist preachers partly by providing the city’s printers with a rival income stream in the form of his own plethora of Catholic sermons and tracts, which, with the generation of the Counter-Reformation to work on their appeal, were presumably more lively and readable — and themselves "extreme" — than those of the Catholic divines of Leipzig 40 years earlier. This is what the printing presses do: they corrupt susceptible hearts. The silly asses do not see this, and brutes rejoice in the fraudulent title of teachers, exalting themselves with a song like this (be so good as to liste): ‘O good citizen, rejoice: your city is well stuffed with books. For a small sum, men turn themselves into doctors in three years. Let thanks be rendered to the printers!’ Any uncultured person without Latin bawls these things. He’s got us there too, I’m afraid, but now as then there’s no looking back. If in some sense culture has declined with the advent of printing — Plato, of course, thought that writing itself was destructive of memory, the mother of the Muses — science has advanced. Professor Pettegree tells us, for instance, that the related invention of new means of illustration was crucial to the development of scientific method and technique. "The development of the technical woodcut had important consequences, both philosophical and practical" because it "helped tip the balance of scholarly investigation towards a science of investigation" and away from the authority of the ancients, though these (especially Aristotle) in their magic, hand-copied codices remained strong for some time yet to come. Early German leadership in science, especially botany, therefore had its origins in the German expertise in the technique of woodcut. Also, with printing came globes, which forced a greater precision in geography. Professor Pettegree does not mention what to me seems an equally far-reaching cultural consequence of the printing press, namely its contribution to the birth of Cervantean irony and mock-epic out of the democratization of courtly romance. That ironic approach to the heroic is now and has long been the norm, and must be at least partly the result of the sudden availability of many more non-ironic romances to stock Don Quixote’s library than had ever been available to him and his kind before. We have seen a further development of the same cultural tradition in a similar cultural shift of our own time with the birth of camp and its contemporary offspring, postmodernism. In both cases, an elite audience for the new, more democratic and egalitarian art forms — popular romance in the first instance, film in the second — found a way to make itself superior to the less self-conscious consumers of the new forms as a condition of their acceptance. The Pettegreean account of the last complete revolution in information management systems has only been made possible by its successor, the most recent such revolution. And its account of that earlier revolution also makes clear that it effected a similar revolution in culture to that which began in the late 20th century with the invention of the microchip. That is to say, both revolutions brought about a change not only in the way information was stored and retrieved and the efficiency of both operations, but both also produced a revolution in the way that people lived and thought about the world. The nature of that revolution is beginning to be a little clearer in the case of the electronic information systems with which we have lately grown so familiar, though I count it interesting that some of the most enthusiastic missionaries for the new systems like Steven Pinker are trying to deny this. Ironically, it has been the next great information revolution — the internet — that has allowed this work on the first age of print to be pursued to a successful conclusion. The steady development of online library catalogues in the last twenty years has allowed scholars to draw together data from a mass of libraries around the world to create a master list of editions for each part of Europe — and hence for the whole of the first era of print. This also records, for the benefit of users, where all these often very rare books are to be found. The result is a total repertory of around 350,000 editions, and some 1.5 million surviving copies. Maybe the ultimate effect of the electronic revolution will be to create huge mines of information into which — even (or perhaps especially) when they contain as many riches as Professor Pettegree’s book — fewer and fewer people will ever be inclined to venture.